Ballybunion Old Course Hole 1: The definition of a scary first tee shot (at least mentally) lies in the graveyard that is just right of the fairway. There are few worse ways to start a golf round than to disturb the peace of the deceased. 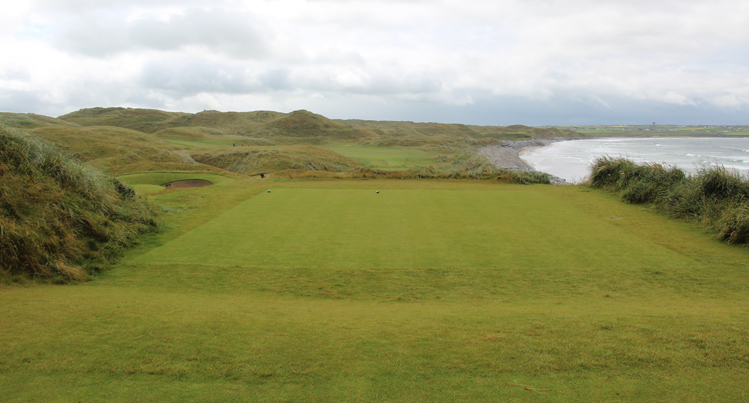 If the golfer can avoid that start, the rest of the golf hole, which plays towards the town of Ballybunion, is fairly straightforward. 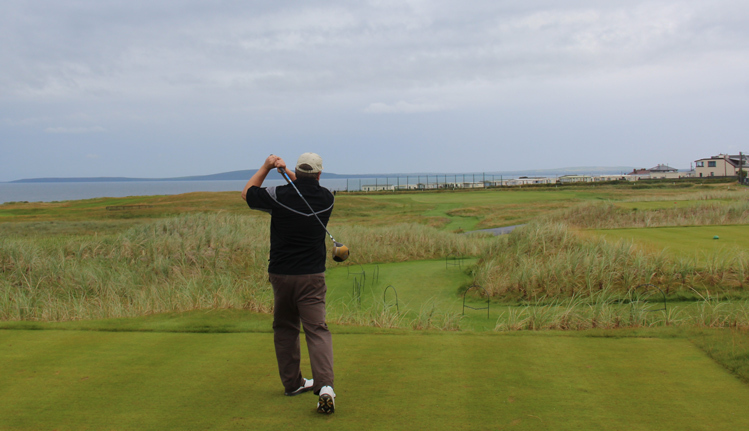 Ballybunion Old Course Hole 2: This long par four is a brutal test of golf. The drive has four bunkers to contend with and finding any of them will not allow the golfer to hit the green in regulation. The putting surface is way uphill between two dunes and with three deep bunkers. Ballybunion Old Course Hole 6: Not long, and representing the last hole by the town, this dogleg left needs a drive that presents a good angle to the green by finding the right half of the fairway if possible. The green is very long and very narrow with steep slopes on either side, so accuracy is key. 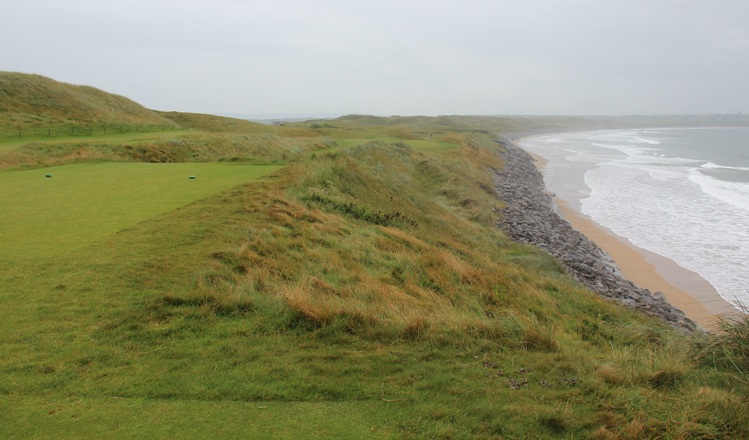 Ballybunion Old Course Hole 7: One of the gems of Ballybunion, this par four plays into the prevailing wind and the concept is simple: do not go right on either shot. The cliffs are not far from the fairway or green, and although they are not good for score, the location of the hole along them is invigorating. 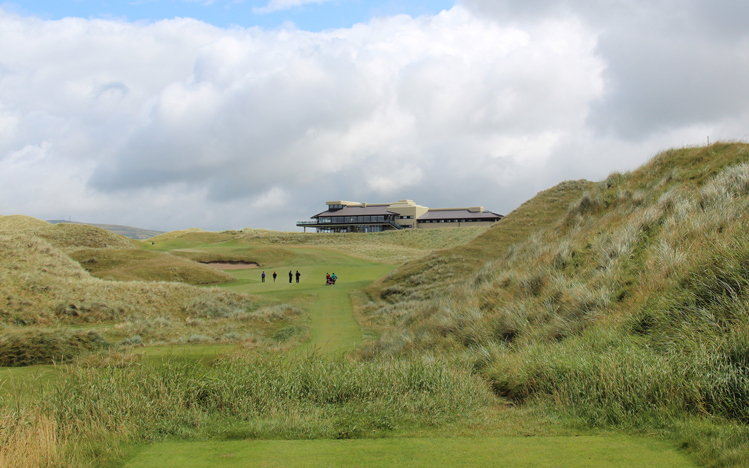 Ballybunion Old Course Hole 8: On paper, this par three isn't much, but the architecture of the green complex is superb. The mounding around the green can bounce balls kindly directly towards pins or send them hurdling down into bunkers or low chipping areas. Ballybunion Old Course Hole 10: This par four is not overly difficult, with the drive just needing to fly and/or stay just right of the hump left of the fairway. The green is contoured but fairly large and guarded less than many others on the course. Ballybunion Old Course Hole 11: This par four is legendary and is widely regarded as one of the better seaside par fours in the world. The fairway is like a rollercoaster heading down towards the green, with many levels and undulations between. 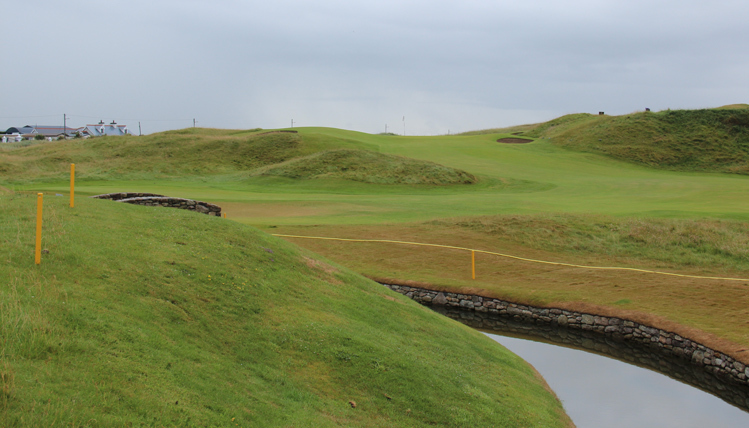 The approach is to a green settled between dunes and general golfing misery if it should be missed. Ballybunion Old Course Hole 13: This par five is all about the second shot that must avoid the little creek that runs through the hole. The green is elevated and guarded by a couple of bunkers. Ballybunion Old Course Hole 15: This downhill par three is pretty long, with a fairly large and tiered green surrounded by bunkers. Missing left is a little better than right, but not much. 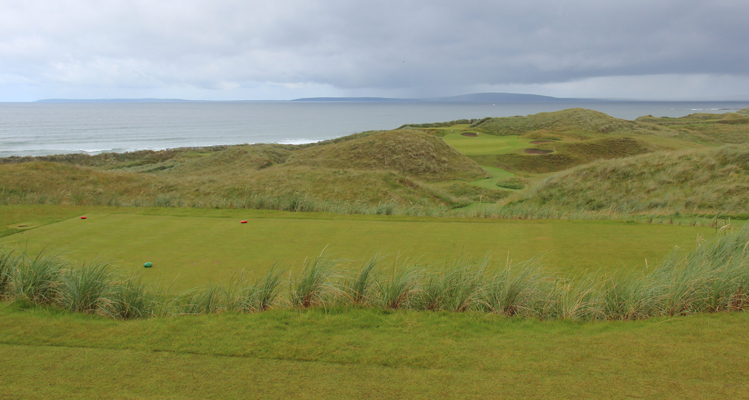 Ballybunion Old Course Hole 16: From tee to green, this par five dazzles. A massive dogleg left, the drive sees the Ocean to the right but can't bite off more than they can chew or they face deep heather and dune. From the fairway, the hole heads straight uphill narrowly between two dunes to a green that seems to be framed only by the sky beyond. Ballybunion Old Course Hole 17: The 17th had an elevated tee and is located in an idyllic golf setting that few places can provide. It sweeps left between a string of large dunes and the ocean to the right. It requires two solid shots to avoid trouble in one of those two forms. 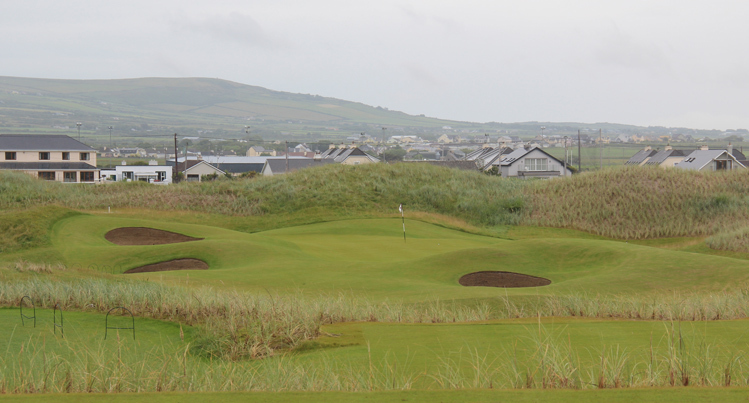 Ballybunion Old Course Hole 18: The finishing hole has a few landmarks. First, the fairway bunker, which seems a fortress, must be avoided. The second is the iconic clubhouse overseeing the hole. The green itself is way left around and between bunkers and dunes, once again.